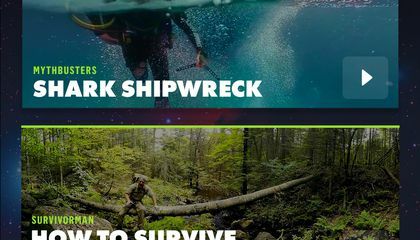 Discovery is unleashing the first videos for its virtual reality network. It's called Discovery VR. It is a brand new service that is testing the limits and capabilities of the immersive format. The videos will debut on DiscoveryVR.com, YouTube and on Android and iPhone apps. They reveal some of the promise of the medium. It covers every angle you could possibly look. It's navigable by moving a smartphone around you. Or even clicking and dragging the viewing angle around with a mouse. In the short video, "Shark Shipwreck," sharks swim around and above you. One even bumps the camera rig. Meanwhile, a narrator explains that the scent of food is being released by a diver nearby. Details that might not be obvious, like the parasitic fish that swim along the underbellies of sharks cruising overhead, are revealed when you swivel and look around. In "Freeboarding: San Francisco," viewers are put on the helmet of a skateboarder. The boarder is cruising down San Francisco's famously winding Lombard Street. Looking backward or staring at fans lining the road doesn't get you into an accident. And you might be surprised at which direction outdoorsman Les Stroud enters the picture in "How to Survive the Wild." That is because the forest scenery and burbling brook are entrancing on their own. That is even before he walks in unnoticed and starts discussing the day's survival lesson. Conal Byrne, Discovery Communication Inc.'s senior vice president of digital media says the point of the project is to determine what works in the emerging format. For instance, finding out what could make someone feel ill or disoriented. "It needs to be repeated that we're experimenting a lot," Byrne says. "There are borders and boundaries that we're really going to try to push." In addition to computers and mobile devices, the Discovery VR content can also be viewed using virtual reality headset devices. 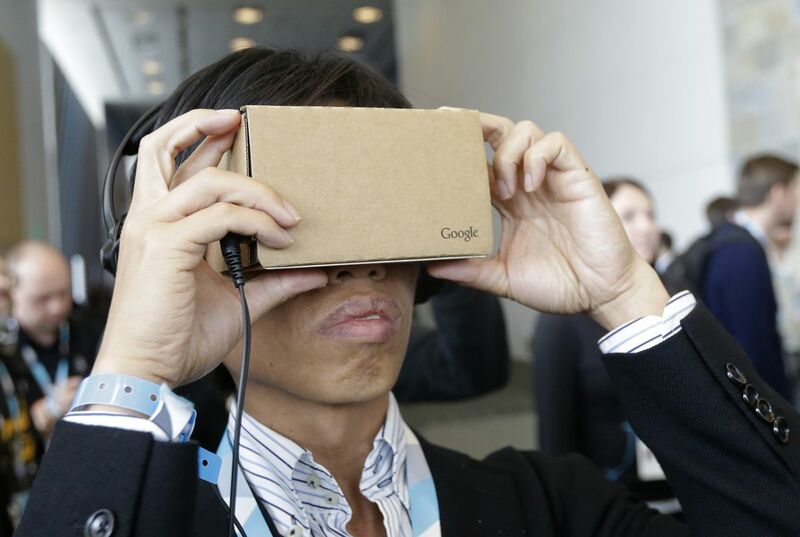 Those include Google Cardboard and Samsung Gear VR. They are on sale now. It also will be available on Facebook's Oculus Rift. That is expected early next year. Some content will be linked to existing shows such as "Survivorman," ''Gold Rush" and "MythBusters." Others are original creations. They will exist in categories like the thrill-seeking Adventure and placid Planet. Discovery VR plans to unveil new content every week at least for the next 12 months, Byrne says. Is it true that cats haven’t been domesticated yet? Why might this format make you ill? I think that it is amazing for Discovery to have made the Discovery VR. I believe that it is amazing because this technology can change the world. I think that using the Discovery VR, many things could open up. The multiple uses for this this technology can possibly be close up view on animals, better sight of things, and etc. This is all just kind of weird. I think that technology is really taking over the world. If the power or Internet went out for a while no one would know what to do. I'm not saying this isn't interesting or anything, I'd just like to see the world take a step back from technology for a little while. It is really cool to see a device that makes you watch that you are swimming around with the sharks. If I had one I would be lucky because no one have this yet in L.A, but it might be boring to watch the clips again and again. Also you have to hold the device and it might be tiring to hold it for 1 hour if the clips are that long. This thing is kind of cool now because they show some cool things and it will look real that if feels like your the one in the video swimming under sharks, cruising down on a skateboard, and even surviving the wild. I think it will look pretty cool once I look at the video. I think that Virtual Reality can be very useful and helpful, as well as entertaining. I think it would be really cool to watch a movie and be able to look around at the environment of the different scenes. I think this article really shows how virtual reality can be fun. Having the ability to see every angle by moving your phone around is similar to using an Oculus. It is an object you can wear on your head to do the same things. I've seen most people use them during gameplay. However, using your phone you would not have to purchase the Oculus. It's a cheaper version of the same thing. Wow, that's crazy. I thinks it pretty cool how you can steer yourself just by moving the phone or tablet. This format would make people sick because people can get motion sickness really easily. I've watched a movie that had an unsteady camera and got sick. This format of virtual reality might make you ill because it makes your vision out of sync with your sense of balance. When using this virtual reality machine, your sense of vision receives different input. During one of these experiences, you might look as if you are moving through a landscape. In real life, however, you are still. When your ears' sense of balance conflicts with your eyes' vision, you become dizzy. Your health could be impacted negatively by this.